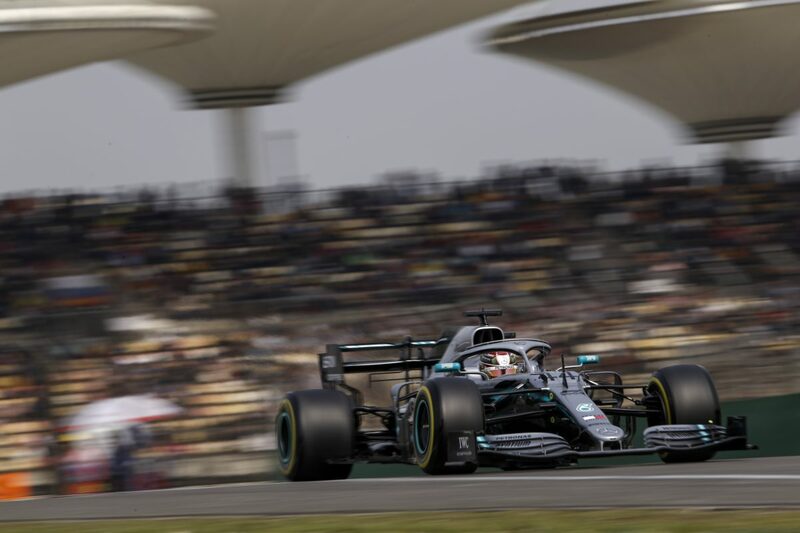 Lewis Hamilton romped to a sensational victory at the 1000th round of the Formula 1 World Championship, claiming a record-breaking sixth win at the Shanghai International Circuit. Hamilton controlled the race from Lap 1, taking the lead into Turn 1 having set off the line much better than team-mate Valtteri Bottas. The Finn crossed the line in second to secure Mercedes’ third straight one-two finish and extend their lead in the constructors’ championship to 57 points over Ferrari. Ferrari’s Sebastian Vettel rounded out the podium positions, Red Bull’s Max Verstappen crossed the line in fourth, and Charles Leclerc was a disappointing fifth. Before the race had even begun, Verstappen and Williams’ Robert Kubica became caught out on their cold tyres, spinning on the formation lap. More drama unfolded on Lap 1 with Daniil Kvyat in the Toro Rosso colliding with both McLarens at Turn 4. Carlos Sainz lost parts of his front-wing while Lando Norris suffered floor damage when he was propelled into the air by Kvyat’s STR14. Kvyat was eventually dealt a drive-through penalty by the stewards while Norris’ new front-wing started scraping on the race track, forcing him to come back into the pit lane for another nose. The two would eventually retire late into the race with damage on their cars. The Ferraris of Vettel and Leclerc swapped positions on Lap 11 after the duo started losing time to the runaway Mercedes. Leclerc’s race would become no easier for the rest of the day, running on the wrong tyre strategy compared to his rivals. Romain Grosjean initiated the midfield pit stop battle, executing a successful undercut move on Renault’s Nico Hulkenberg on Lap 12. However, Hulkenberg’s race would end early, suddenly returning to the pit lane to retire the car on Lap 18. Verstappen was the first of the top five to pit for the white-marked hard compound, which prompted Ferrari to bring Vettel in to also switch him onto the hard tyres on the following lap. Upon returning to the track, Verstappen attempted a pass on the German, lunging down the inside at the heavy braking zone of Turn 14. However, it would be an unsuccessful attempt, with the Scuderia driver taking back the place at the exit of the turn. The pit stop battle would be the main talking point of the race with Ferrari electing to keep Leclerc out on a one-stop strategy. Verstappen was the first front-runner to come in for a second stop, once again forcing the hand of Vettel who copied the Dutchman’s strategy on the next lap. It prompted Mercedes to bring both of their men in another lap later and they managed the double stack in smooth fashion. Leclerc was briefly able to run in second position before Bottas and Vettel moved ahead again. The Monegasque eventually came in for his second stop on Lap 43, accidentally engaging his clutch while exiting the pit box. He re-joined the race 14 seconds behind Verstappen but wasn’t able to gain any time on the 21-year-old. Pierre Gasly made a last-gasp attempt to set the fastest lap, given he was able to take a free pit stop with seventh placed Daniel Ricciardo over 30 seconds. The Frenchman stole the additional point from Bottas on the penultimate lap, adding to the eight he collected for finishing sixth. Ricciardo finish for the first time in Renault colours, driving a quiet race to come home in seventh position, ahead of Racing Point’s Sergio Perez and Kimi Räikkönen in the Alfa Romeo machine. The battle for the final points paying position came down to the last lap with Alexander Albon holding off Romain Grosjean for 10th. The Thai ran a measured race to claim his first championship point after starting from the pit lane having missed qualifying due to his high-speed crash in Practice 3. Haas walks away from China with no points despite both Romain Grosjean and Kevin Magnussen starting the race in the top 10. Their weekend was one to forget having struggled with tyre temperature issues throughout. Hamilton’s win sees him take the drivers’ championship lead ahead of Round 4 in Azerbaijan on April 26-28.